The above link will take you to a website where you can upload a photo to Green Castle AeroClub. The photo will be reviewed and if appropriate, will be added to the photo gallery. By uploading your picture, you agree to the disclaimer below. 1. Click on the link Click Here to Upload a Picture. Please be patient as the form takes some time to load the first time. 2. Fill in your information and select the file to upload. 4. Ignore the "Upgrad to Pro" message. By uploading and applying your Image ("Image"), you warrant and represent that you own or otherwise control all of the rights to your Image, including all the rights necessary for you to provide, post, upload, input or submit the Image, and to transfer all such rights to Green Castle AeroClub. In addition to the warranty and representation set forth above, by uploading and posting an Image that contains images, photographs, pictures or that are otherwise graphical in whole or in part (“Images”), you warrant and represent that (a) you are the copyright owner of such Images, or that the copyright owner of such Images has granted you permission to use such Images or any content and/or images contained in such Images consistent with the manner and purpose of your use, and (b) that each person depicted in such Images, if any, has provided consent to the use of the Images, including, by way of example, the distribution, public display and reproduction of such Images. By posting Images, you are granting to all persons who have access to the Images, without compensation, permission to use your Images in connection with the use, including a non-exclusive, world-wide, royalty-free license to: copy, distribute, transmit, publicly display, publicly perform, reproduce, edit, translate and reformat your Images without having your name attached to such Images, and the right to sublicense such rights to third parties. Licensed: You can prove that the copyright holder has released the image under an acceptable license. Note that images that are licensed for use only on certain "channels", or only for non-commercial or educational use, or under a license that doesn't allow for the creation of modified/derived works, are unsuitable. When in doubt, do not upload copyrighted images. 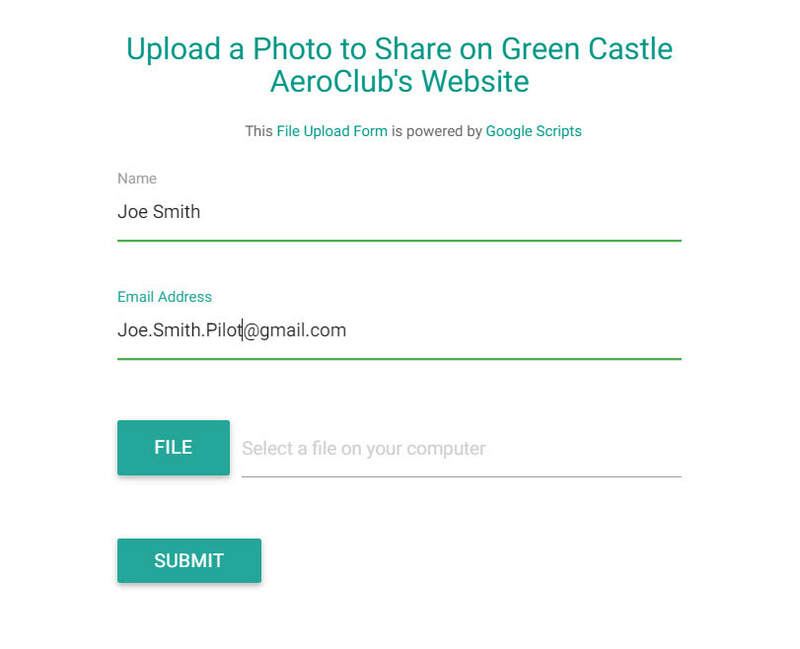 Green Castle AeroClub encourages users to upload their own images. Such images can include photographs which you yourself took. The legal rights for images generally lie with the photographer, not the subject. Images with you, friends, or family prominently featured in a way that distracts from the image topic are not recommended. Some images may contain trademarked logos incidentally (or purposely if the image is either licensed, covered under freedom of panorama, or being too simple to be copyrightable). If this is the case, please tag it with ™. You've obtained the right (paid or free) to exploit the image in all media throughout the universe for a specified amount of time; in the case of a pre-existing free license, if the place where you found the image does not declare a pre-existing free license, yet allows use of its content under terms commonly instituted by them, it must explicitly declare that commercial use and modification is permitted. If it does not so declare, you must assume that you may not use the image unless you obtain verification or permission from the copyright holder. When taking pictures of identifiable people, the subject's consent is not usually needed for straightforward photographs taken in a public place, but is often needed for photographs taken in a private place. This type of consent is sometimes called a model release, and it is unrelated to the photographer's copyright. Because of the expectation of privacy, the consent of the subject should normally be sought before uploading any photograph featuring an identifiable individual that has been taken in a private place, whether or not the subject is named. Even in countries that have no law of privacy, there is a moral obligation on us not to upload photographs which infringe the subject's reasonable expectation of privacy. If you upload a self-portrait, your consent is presumed.